Microsoft’s Surface 2 tablets finally go on sale today—so it's a good time to begin thinking about the real impact these devices will have on the greater Microsoft ecosystem. Indeed, ever since the tablets were introduced in late September, most people have been thinking about them the wrong way—the old way, considering them in isolation rather than as individual members of a cohesive team. In fact, though, Surface 2 and Surface Pro 2 are elements of a greater plan that includes Windows, Windows Phone, Office, the cloud, and enterprise products. All of them work together to move Microsoft's ball down the field. So let's look at each product from that perspective—and explore the areas where each Microsoft product line needs to improve. Microsoft’s apps are designed not merely to lure you in, but to keep you in the Windows ecosystem. The Windows OS—whether for consumer PCs, enterprise PCs, tablets, or servers—is the nexus of Microsoft's new, unified ecosystem. It's our entry point into SkyDrive, Xbox Music, Bing, and other services that play key roles in Microsoft's grand scheme. 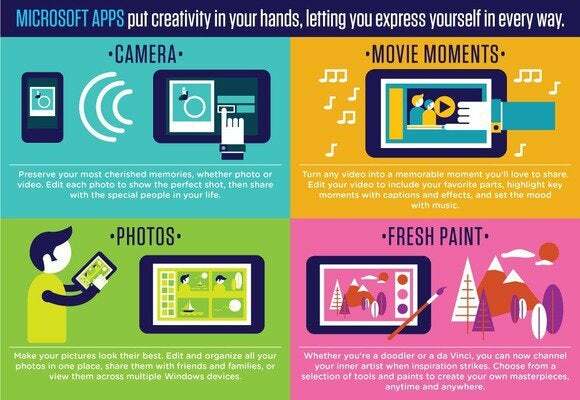 Sure, in Windows 8.1, Microsoft added a number of features that make the OS easier to use. But even more important are the features that reinforce Microsoft's goals for its greater ecosystem. When you're playing with the new Windows 8.1 update, take a good look at the improved Mail app, which filters out spam posts Microsoft doesn’t want, and opens photos and Web pages within Microsoft’s dedicated apps. Notice, too, Bing’s new “smart search” feature, which crawls through local files and the Web—and cleverly conditions users to think of local files as being simply a cached version of the cloud. Skype is now directly integrated into Windows as well, offering a path for the OS to become a full-fledged communications tool. And of course SkyDrive can intelligently sync all of your files in the cloud. It's a savvy play on Microsoft's part: When all your important data is backed up to the cloud—Microsoft’s cloud—you become increasingly locked in to using Microsoft's services for everything. 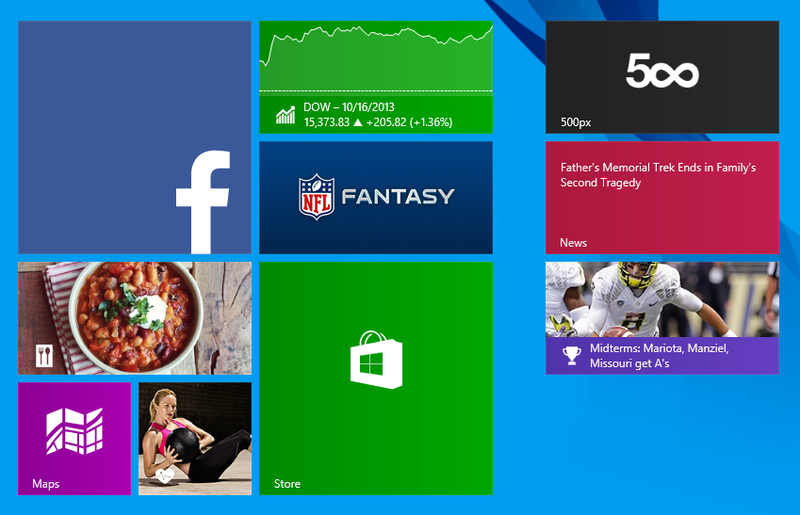 Microsoft's Windows Store still suffers from a dearth of third-party apps. So, that's where Windows is today—but in what areas does Microsoft need to improve? Apps, apps, apps. Microsoft’s Windows Store should try to sell me Call of Duty, and allow me to download it on every PC tied to my Microsoft ID. App descriptions should point out when complementary versions are available on Windows Phone and Xbox. Microsoft should incentivize developers to create their own ecosystems within the Microsoft environment. And Microsoft’s dev teams should keep pumping out their own first-party apps, ensuring that they tie into other apps seamlessly and synergistically. Why don’t I have the option of sharing an image I open with Photos, for example? From a design perspective, Microsoft’s original Surface Pro was Microsoft's challenge to hardware partners: Windows is becoming a dynamic, modern operating system, so you need to break away from cookie-cutter designs and envision an equally dynamic, modern piece of hardware. As such, the new Surface 2 and Surface Pro 2 (like their Surface predecessors) function as ecosystem lures. They're designed to entice people to join Team Microsoft, and to focus attention on Windows 8.1 and its associated apps and services. To this end, the basic Surface 2 includes Office; and Microsoft will also toss in 200GB of SkyDrive storage for two years, plus a year’s worth of free calls on Skype to any phone, anywhere. Microsoft has also doubled down on its message that Surface tablets are engines of productivity, emphasizing the utility of its Touch and Type Covers, and giving Surface Pro 2 a docking station. Microsoft’s face of the Surface, Panos Panay, would like you to think that the Surface app ecosystem is thriving. But where do Surface tablets stand as entertainment-driven "consumption" devices? Is Microsoft just going to cede that market to Apple, Amazon, and Google? Well, a “mini” Surface tablet is expected next year. If and when it arrives, Microsoft would be well served by rearranging the basic Start page to position consumption apps like Xbox Music, Video, Reading List, and (especially) a SmartGlass app front and center. 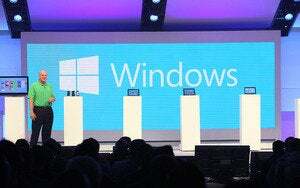 Eventually, some observers predict, the Windows RT–based Surface 2 will blend into Windows Phone. That sounds like one possible evolutionary outcome for the Surface mini, creating a “phablet” that would bridge the mobile and desktop worlds, as Android and iOS have done. Are mini tablets like this Acer Iconia W4 the future of the Surface line? Microsoft obviously hoped that the Surface tablet would be a “halo” device like the iPad, but that hasn’t happened. So now, Microsoft seems interested in reaching out to specific customer segments via hardware experiments like its new “blade” peripherals. Will we see a video-editing blade? Branded World of Warcraft blades? An E-Ink blade for dedicated e-reading? We should. Crazy ideas, sure, but Microsoft’s developer corps hasn’t delivered unique, compelling software experiences. So Microsoft’s hardware teams need to step up instead. Of all Microsoft's recent updates, the one for Windows Phone seems to cater least to the idea of a unified ecosystem. It adds support for quad-core processors and larger screens—evidence that some sort of phablet is in the queue—but Microsoft has been diffident about using Windows Phone to promote its broader ecosystem. Quick, what’s the most important notification on this page? The system's reconfigured screens now permit six Live Tiles across one row, instead of just four. Ironically, if Microsoft had the booming third-party developer support that iOS and Android enjoy, this change might be a significant new feature—a way for Microsoft to promote the diversity of its apps ecosystem. As it is, however, the multitude of Live Tiles does little more than turn the Windows Phone home screen into Times Square, third-party apps or no. All that said, even without any significant "ecosystem booster" features in its latest update, Microsoft has done a good—but not great—job of making Windows Phone a team player among other products and services. The company integrated Office and SkyDrive into the phone OS long ago, and Skype-to-Skype VoIP could end up disrupting international calling. Microsoft still needs to improve integration of the Xbox, if it can. But hey, at least executives at Microsoft’s future hardware division, Nokia, seem to understand how the Windows Phone platform needs to evolve. ”We are releasing new devices frequently and for every new device, if there is an app that somebody cares about, that’s not there, that’s a missed opportunity of a sale,” Nokia vice-president Bryan Biniak told the International Business Times in July. “You can’t sell a phone without the apps, you just can’t,” he said. 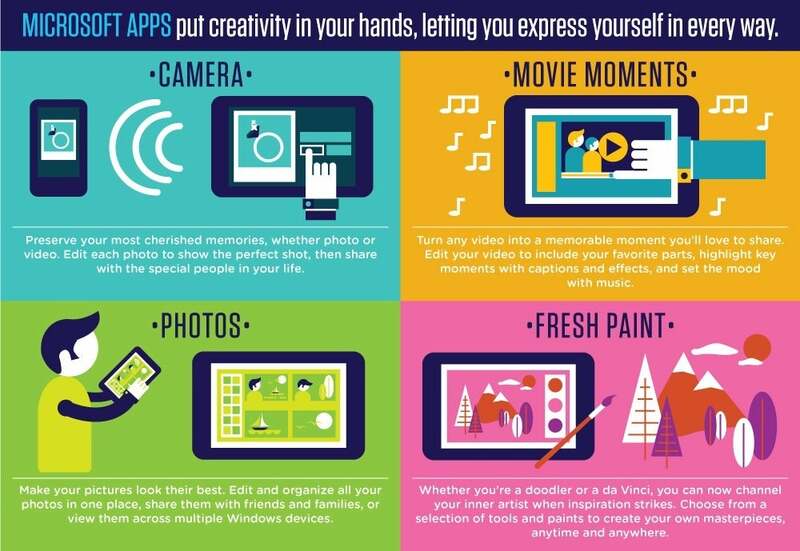 And apps are what Windows Phone needs most of all. Office, perhaps Microsoft’s strongest current asset, is evolving from a tactical tool into a strategic tool within the company's ecosystem. Obviously, bundling Office with the Surface tablets and partner devices shows that Microsoft is leveraging Office as a major selling point. But that is just Office's most obvious function. More subtly, Microsoft is broadening Office’s reach to the Web. The move adds feature bloat to an already bloated product, but it also reinforces Microsoft's greater goals. Office for mobile devices still requires an Office 365 subscription. And no, it still isn’t on the iPad yet. Tying Bing search and “live data” to Office documents is a brilliant idea that hasn’t quite taken hold yet. But it will. More and more, Office is about sharing data and collaborating via multiple tools, including Lync, Yammer, SkyDrive, and Skype. Of course, Word, Excel, and PowerPoint are solid programs, but they’re also table stakes in today’s workplaces. I’m not convinced that businesses and consumers are using Office to its full capabilities, but the power is there. And of course, we can't forget Microsoft’s new business model: the subscription-based Office 365, which offers the Office suite plus SkyDrive storage plus Skype calls. Everyone hates paying for subscriptions—what do I need that for, again?—but Office 365 trains consumers and businesses to treat Office as a periodic fixed expense, like rent. Over time, Microsoft plans to update its Office 365 offerings to subscribers, with new features and continual improvements. It could also provide a roadmap to future service enhancements, to maintain anticipation. But it doesn't need to rethink its basic strategy. Microsoft is already doing a terrific job of building Office into its ecosystem. Microsoft’s consumer cloud begins and ends with SkyDrive. In the enterprise space, however, Microsoft has created its own ecosystem. 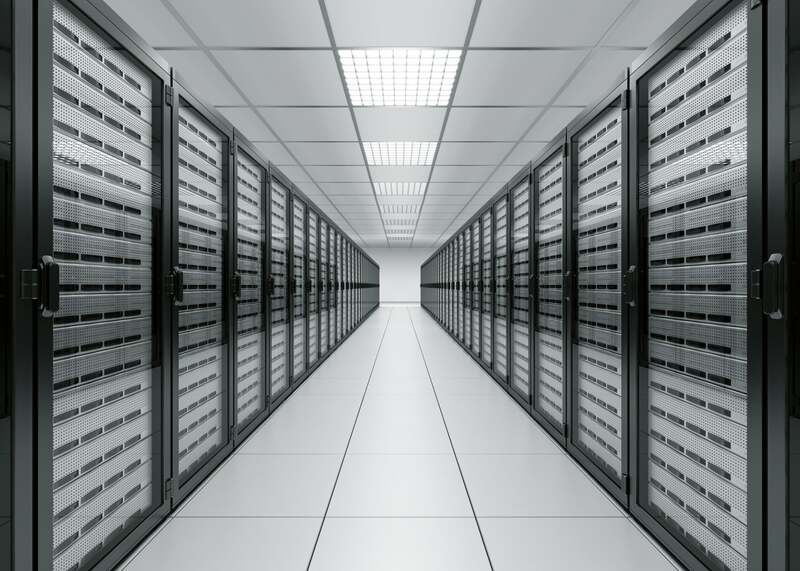 SQL Server, Exchange Server, and Dynamics’ ERP and CRM businesses all tie into Windows Server. Windows Azure powers Microsoft’s cloud business, competing with Amazon and other companies for their data. Microsoft’s goal is to offer the same business capabilities, whether they be in the cloud or on a server on the business's premises. Microsoft’s products for enterprises' data centers help demonstrate Microsoft’s cloud competence—and generate a nice pillar of revenue to help support other divisions. Consumers will likely care little about that laundry list of products. But Microsoft is selling a belief that its cloud technology can get the job done in a way that’s simple and robust enough to lure both startups and large enterprises. Meanwhile, tools like Visual Studio are critical to ensuring that third-party developers make the apps that enrich our consumer platforms. But that brings us back to the obvious hole in Microsoft’s ecosystem: the lack of third-party apps that tie in with Microsoft’s services. A random Android game like Flick Golf is a nice time-waster on its own. But publish a user’s activity and scores to the Xbox platform, and you cross-pollinate both the app and the Xbox platform. Microsoft isn't going to step forward and say, “Hey! Buy a Surface—it has the same browser as your Xbox!” But it needs to do a better job of telling you that when you own an Xbox and a Windows PC and even a Windows Phone, the sum of your purchases will be greater than the parts. And until it does that, Microsoft is going to struggle.